The Mercury Theatre Colchester’s Mercury Rising campaign has taken another big step forward, following a decision by Arts Council England’s (ACE) National Council to formally progress the project to Stage 2 of its Large Capital Programme. This is the latest green light for Mercury Rising, following the planning approval granted by Colchester Borough Council in September. All eyes are now on the Mercury’s Board to grant final approval for the project to proceed, in mid-January. Arts Council England’s decision confirms a total of £4m in funding from the Large Capital programme, and unlocks a further £1m from the South East Local Enterprise Partnership’s (SELEP) Local Growth Fund, and £200,000 from major national funder the Garfield Weston Foundation. These contributions were conditional on progressing to Stage 2 of the Large Capital Programme. Colchester Borough Council and Essex County Council are each investing £1m in the project, which is jointly managed by Mercury Theatre and Colchester Borough Council. This investment by the councils has been critical to attracting major funding from national sources. SELEP’s Accountability Board recognised the Mercury Rising campaign’s ambition to create a world-class theatre for artists and audiences, to improve the user experience and attract more visitors to its performances. The project is on track to start on schedule. Subject to a successful tender exercise in early 2018, demolition will begin at the rear of the theatre – without affecting audiences – in the spring, followed by the construction of the production block. The Mercury will close for a year from February 2019 when work takes place on the foyer, and will deliver an exciting programme offsite in a temporary theatre structure. The Mercury has entered early exploratory discussions with St. Thomas More School, Colchester Borough Council, and Firstsite to lease part of Berryfield Lawn, an area of land between the Firstsite gallery and the Culture Quarter development on Queen Street, for this purpose. More details of this will be announced in the spring. For more information on Mercury Rising and how you can get involved, please visit www.mercurytheatre.co.uk/rising. Sponsor a brick, adopt a seat, or send us your spare change – there are many ways to support Mercury Rising! 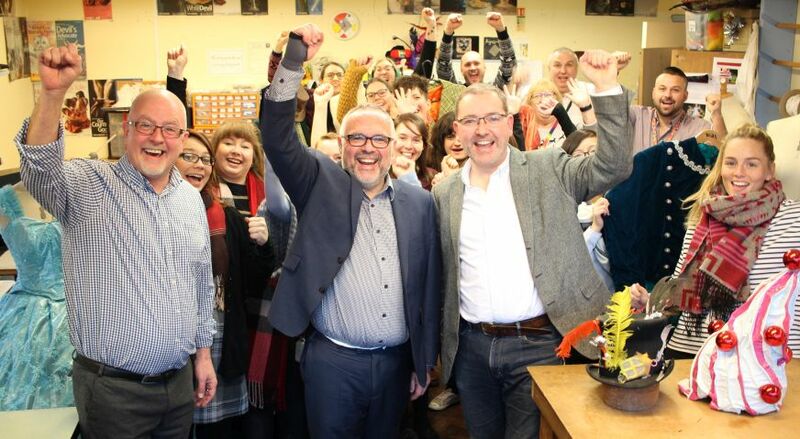 L-R Steve Mannix (Executive Director of Mercury Theatre); Cllr Tim Young (Deputy Leader of Colchester Borough Council); Daniel Buckroyd (Artistic Director of Mercury Theatre) celebrate with staff in the costume making department which will be transformed as part of the project.